Thanks to Bates relative Kent Bergh for his additions and corrections to the story of the Bates family. Cynthia Sigourney Little Bates was born 1844. She was a well educated Pennsylvania woman who prepared all her daughters to teach school. Cynthia died on October 24, 1934, at age 90. William Platt Bates was born in 1831 in England. In 1860 he was living in Glencoe. He served in the Civil War, and the 1880 Census shows William to be a farmer “debilitated from army service.” Family lore is that he had also been a shoemaker. William died on August 3, 1884. In 1880 the family was living in Minnetonka Township – this was possibly the future city of Hopkins. The 1895 Census puts them in Minnetonka Beach. It appears that they moved to St. Louis Park between 1895 and 1900. Their address in the Park was 3700 Wooddale Ave. The house was at the corner of Wooddale and Goodrich; the City says it was built in 1912. MARY CATHERINE BATES LUCAS was born in 1868. Mary was one of the first two teachers at St. Louis Park’s new Lincoln School in 1890. She married Robert H. Lucas on June 17, 1897. In 1910 he was a farmer in Eden Prairie. She was a school librarian in 1930. 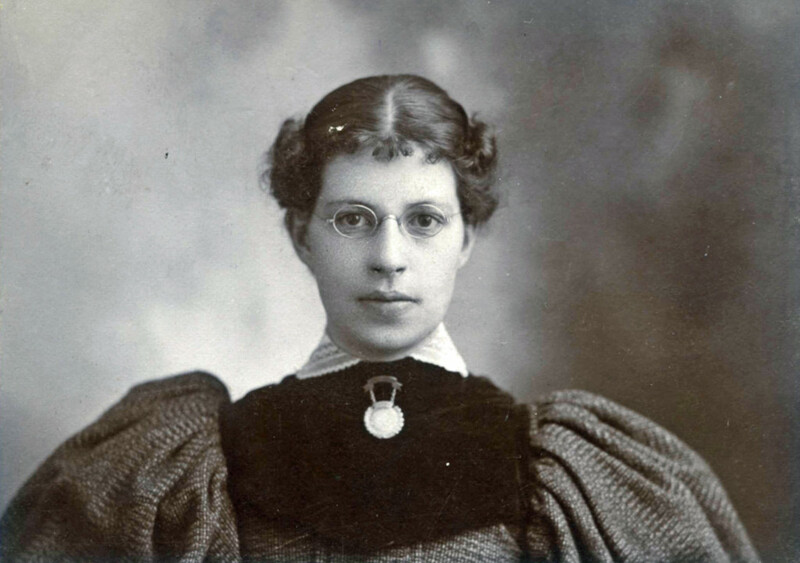 CHARLOTTE E. BATES SMITH was born in about 1867 in Minnesota. She died on September 19, 1936, in Minneapolis. JESSIE LITTLE BATES McCUTCHAN was born on June 14 , 1897, in Rice County, Minnesota. She married William McCutchan, who went from being a Bloomington farmer to selling (perhaps his own?) real estate. She died on July 22, 1942, in Bloomington. LULU M. BATES HARDCASTLE was born in June 1872 in Minnesota. She married William Hardcastle (1870-1934) in 1897. In 1900 they lived in Nebraska; then Iowa Falls and Waterloo, Iowa. Lulu died in 1936. Bertha Bates was born on May 13, 1874 in Glencoe, Minnesota. She graduated from Central High School in Minneapolis in 1894. She taught from 1895 to 1934, first in Anoka and then in Rockford, Minnesota. Her first school in St. Louis Park was the Manhattan Park School, which was said to have been built by Theodore Curtis of the Curtis Hotel. After that she became a legend at Lincoln School. Former students remembered her fondly, but also cautioned that there could be no funny business in her classroom. Bertha lived with her brother Bill at 3800 Wooddale Ave. (at Goodrich, built in 1912), near Aldersgate Methodist Church. Bertha died on November 1, 1957, at the Walker Methodist Home. Irene Bates was born in June 1876 in Hennepin County, Minnesota. Irene also taught at Lincoln School. She left St. Louis Park before 1920. Irene eventually married William Joel Warner; he died in 1930 in Pelican Rapids. Irene died on April 12, 1937, in Minneapolis. WILLIAM N. BATES, born on May 16, 1878, in Minnesota. William apparently never married; in 1940 he was living at the family home at 3700 Wooddale with Bertha. Neither had a profession listed in the 1940 Census. Albert was born on October 11, 1882, in Hopkins. He and his wife Marian had several children. Albert invented the Hadees after-market car heater for early gasoline vehicles, which originally came without them. He died on October 18, 1961, in Rockford, Illinois.